We always think about something. No matter what we are doing, we always think. Every second numerous thoughts come into our mind. With so many thoughts coming, we sometimes take time to process things. Sometimes we take time to come on a particular decision. With such complexity already in our mind, we want to know what the other person is thinking. To be put in simpler words, most of us want to know that how to read mind of anyone. To avoid any kind of harm to self we just want to know what the other person is thinking at present. First of all, is it possible to read someone’s mind? The answer is yes, it is possible. The process which is responsible behind such technique is known as ‘Psychic Meditation’. Also known as ‘Third Eye Meditation’. This technique is in existence for many centuries. Since the ancient time, sages and saints are using this technique to help masses. For the first 10 days speak positive and self cleansing affirmations before going to bed. The above exercise will help us to become more positive and free from bad intentions. ]This time put the other person whose mind you want to read as the main subject. Affirmations should be related to the purpose, i.e. you want to know how he/she thinks about you, what are their intentions and so on. On the 22nd day you will experience the thoughts they have about you in 3 forms: Exact Words, Imagination and Energies. How to Read Anyone’s Mind? Reading someone’s mind does not mean that we will know word by word whatever they are thinking. It means that we will know about their intentions towards the particular subject. Secondly, our intentions matter the most. If our intentions are for self benefit then the exercise will not help us at all. No matter how much experienced we are. Persistence is the key to success. This knowledge is useful to us only when we are practicing it on regular basis while keeping above mentioned points in mind. The art of mind is reading is not technically an art. Instead it is an education which is in existence for centuries. 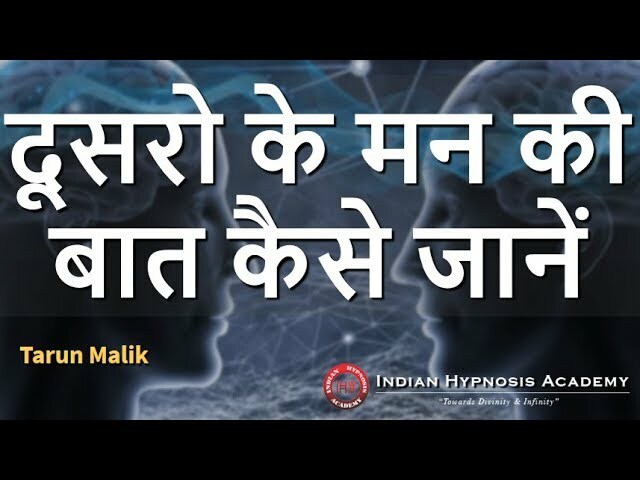 We at Indian Hypnosis Academy regularly conduct Psychic Meditation course for the development of masses. Now you can also learn this technique while being at the comfort of your homes or under the excellent guidance of Dr. JP Malik. He has more than 40 years of experience in the field of psychology and healing sciences. He has trained thousands of students across globe. Now you can also avail the opportunity of studying under him and become better everyday. To know more about the course and it’s content, click HERE. Also subscribe our YouTube channel for regular information.